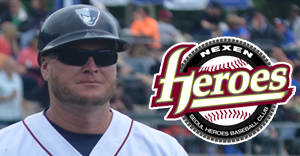 Bridgewater, NJ- The Somerset Patriots have announced that hitting/3B coach Shane Spencer will not return for the 2016 season after accepting the position of field coordinator and manager for the Nexen Heroes’ minor league system in the Korea Baseball Championship. “I want to thank the Somerset Patriots organization for a wonderful time while I was coaching there. I was sad to say that I was leaving for a coaching position in Korea, but it is an opportunity that I just couldn’t pass up,” said Spencer. Spencer joined Somerset’s coaching staff in 2013 and had an immediate impact on the team that finished with a league-best .277 batting average. Spencer helped coach the team to three-straight playoff appearances in his three seasons with the Somerset Patriots, including a division championship in 2013 and a league championship in 2015. “Shane was a perfect fit in Somerset. He truly made everyone around him better. From day one, we had a great comfort level working together. We wish him the best of luck as he takes his skills to Korea,” said Somerset Patriots manager Brett Jodie. During his time in the position, the Somerset Patriots won 264 games. Spencer was the seventh person to serve as hitting/3B coach for the team. “Somerset is a first class organization and anyone that has ever been a part of it knows what I’m talking about. Good luck to Brett, Cory and any returning players on winning another championship,” Spencer added. “He brought a lot of experience and knowledge to our team. The guys really respected him and learned from him. Shane was a huge reason for our success the last three years,” Jodie added. Spencer also spent time with the Texas Rangers, Cleveland Indians and New York Mets. Spencer owned a career .262 batting average with 438 hits, 84 doubles, 59 home runs and 242 RBI in the majors. “Shane did a great job for us and will be missed. The next person we hire will have very tough shoes to fill, but we are excited about the list of people who have expressed interest in the position and want to join our team,” said Patrick McVerry, President/General Manager of the Somerset Patriots Baseball Club.